The Freeport Dive with The Dolphins tour on Grand Bahama Island is a great way to have a meaningful experience with one of nature's most spectacular creatures. 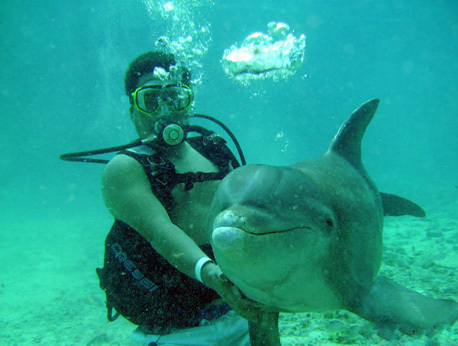 Those who participate in the dive will get to dive and play with dolphins in their own environment. You will be submerged both literally and figuratively into the world of dolphins. While spending time relaxing on Grand Bahama Island, it is important to experience the elements of nature that the island offers to tourists and locals alike. There are few places in the world where one can go underwater and experience the natural habitat of dolphins and sharks. One of the best tourism companies to work with on Grand Bahama Island is UNEXSO (Underwater Explorers Society). They offers several meaningful tourism packages for visitors to enjoy on Grand Bahama Island. By investing in this wonderful tourism experience, you will not only have a cherished memory that you can take with you for many years to come, but you will also have the potential to interact with dolphins underwater. In addition, you will have a great way to take advantage of the diving certification that you have already received. The Dolphin Dive on Grand Bahama Island is a tour that takes 2 hours and 30 minutes from start to finish. Within that time, there is between 30 and 35 minutes actually underwater with the dolphins. The tour costs $219 per person and includes tanks and weights; however, transportation from hotels, airports or seaports is not included in the tour price. Each tour participant must be a certified diver and the diving sites will be subject to the captain's specifications. Additionally, each and every diver must sign liability waivers that they are able to dive. Please check-in at least half an hour before the departure time. Lastly, this diving excursion is not recommended for pregnant women. If you are looking for a meaningful travel experience while you are staying on Grand Bahama Island, consider taking the Dolphin Dive Tour. In doing so, you will have an incredible travel experience to add to your luxurious vacation on Grand Bahama Island. We would be elated to plan a memorable excursion for you and your family. For more information, contact us today.